Time to raise a glass to the fifth season of the show which knows it has one of the worst names on television, Cougar Town. 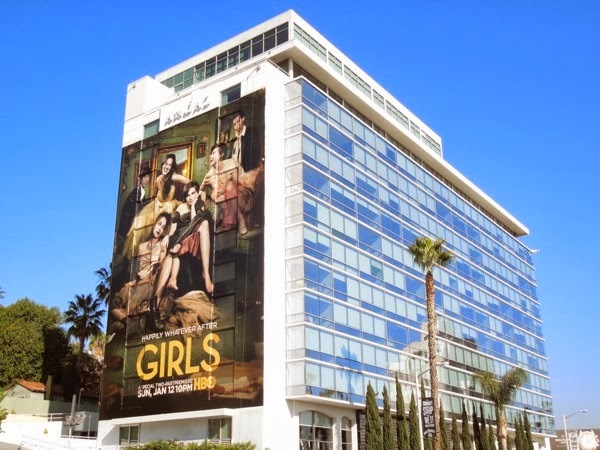 The Courtney Cox sitcom survived the move from networks, from ABC to TBS, and is going as strong as the red wine 'Jules' and the cul-de-sac crew continue to drink with greater frequency (and hilarity). In this all-new season can Jules handle one of her best friends dating her son, her next-door neighbor and confidante Ellie's 'charming' alter-ego, Bobby and Andy's global business success and her new husband Grayson's chance in the spotlight. 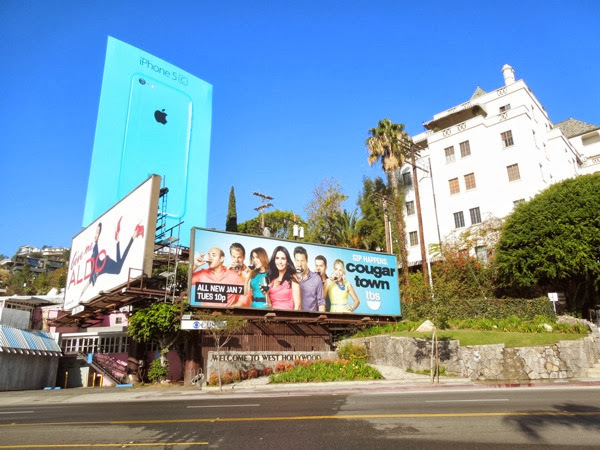 This fifth season billboard was snapped along Sunset Boulevard on December 22, 2013, and if you can't wait for another season of dysfunctional wine-guzzling and Penny Can playing antics, be sure to also check out these previous season Cougar Town billboards. 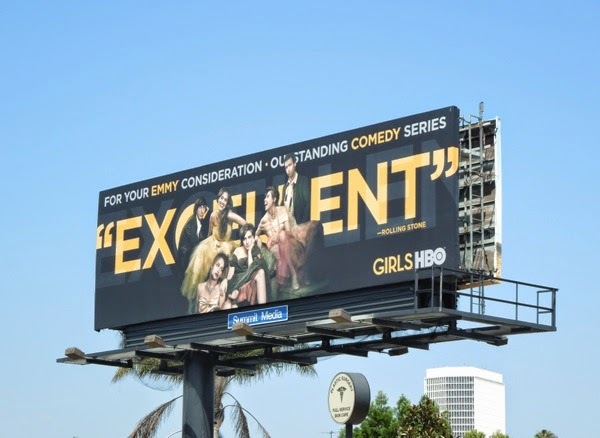 'Monica' isn't the only former Friends star to find new life again on TV, so be sure to also take a look at these billboards for Matt 'Joey' LeBlanc's Golden Globe winning series Episodes. Meanwhile poor Matthew 'Chandler' Perry can't catch a break, as his sitcoms Mr. Sunshine and Go On have both been cancelled in recent years. He obviously hasn't realized the 'Sip happens' at times. 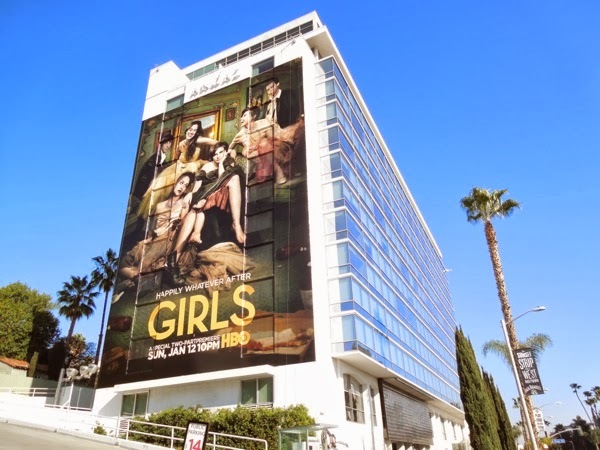 The end of the year may be fast approaching, but there's more than enough new TV series and fresh new seasons of returning favourites to look forward to in 2014. 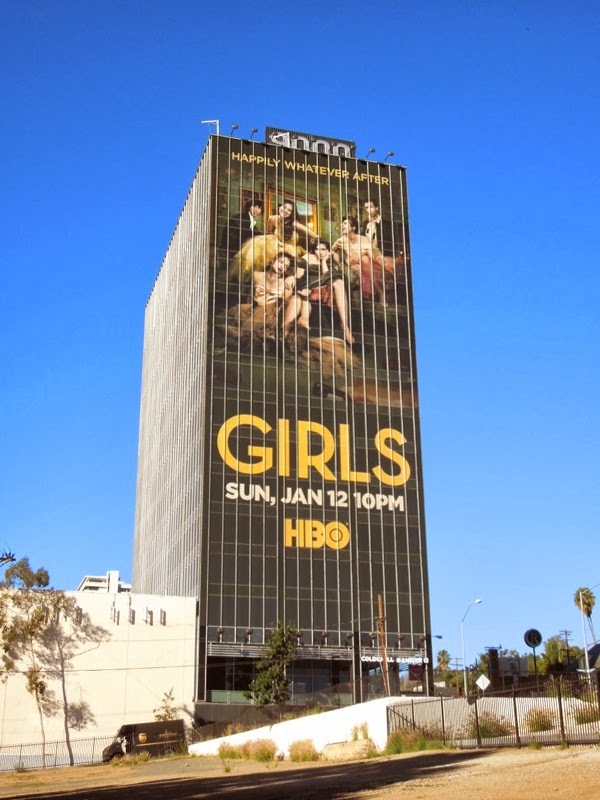 First up, coming back for a third season is the critically-acclaimed HBO comedy-drama, Girls. 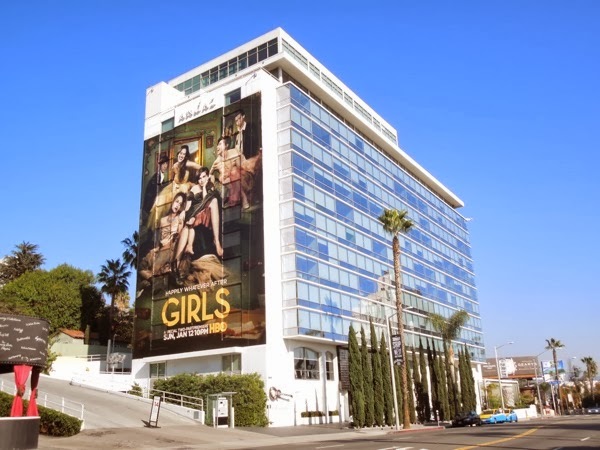 For the first two seasons critics applauded Lena Dunham's more raw and realistic take on young twenty-something young women (and their male friends and lovers) living in Brooklyn, New York, so much so that the actress, writer and director won the Golden Globe for Best Actress for her role as 'Hannah Horvath' earlier this year. 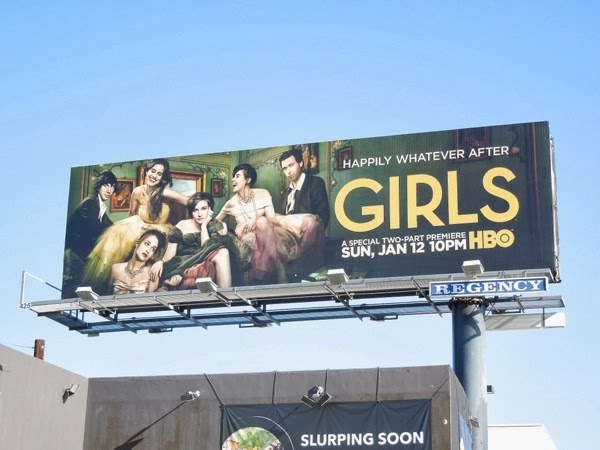 Can she and the rest of the ensemble cast continue to shake things up on TV for a third season with their assorted mix of personal humiliations, tragedies and triumphs, even when their promotional tagline is the ambivalent 'Happily whatever after'. 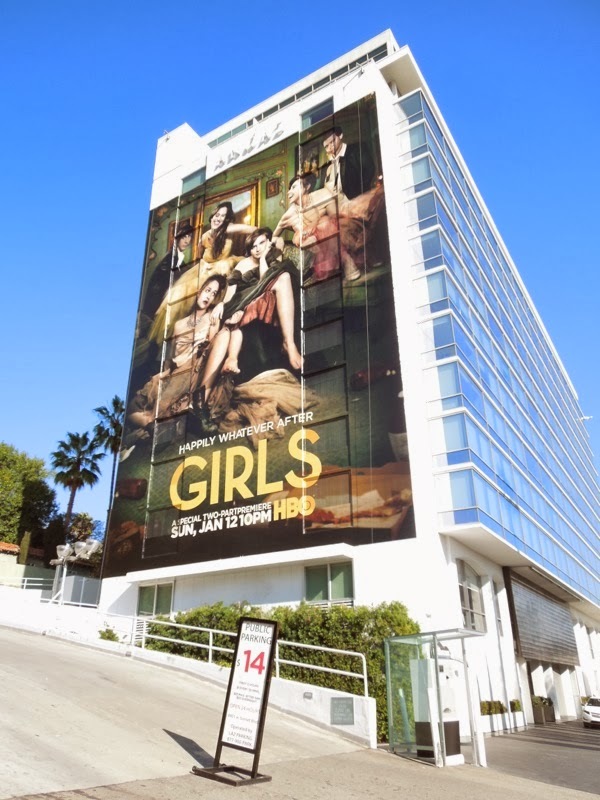 This giant-sized billboard for Girls season three was spotted on the side of West Hollywood's Andaz Hotel along the Sunset Strip, whilst the standard landscape billboard was snapped along Melrose Avenue on December 22, 2013. 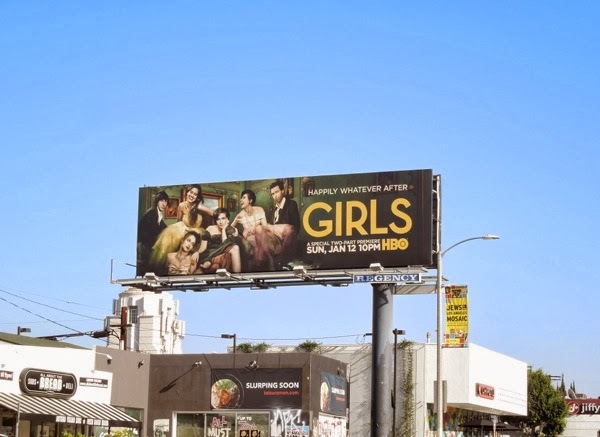 If you're a fan of the show, be sure to check out these Girls season one billboards and Girls season two billboards from around L.A.
Stay tuned in the next six days for a week filled with the newest TV show ad creatives to help usher in a bright and fabulous New Year. 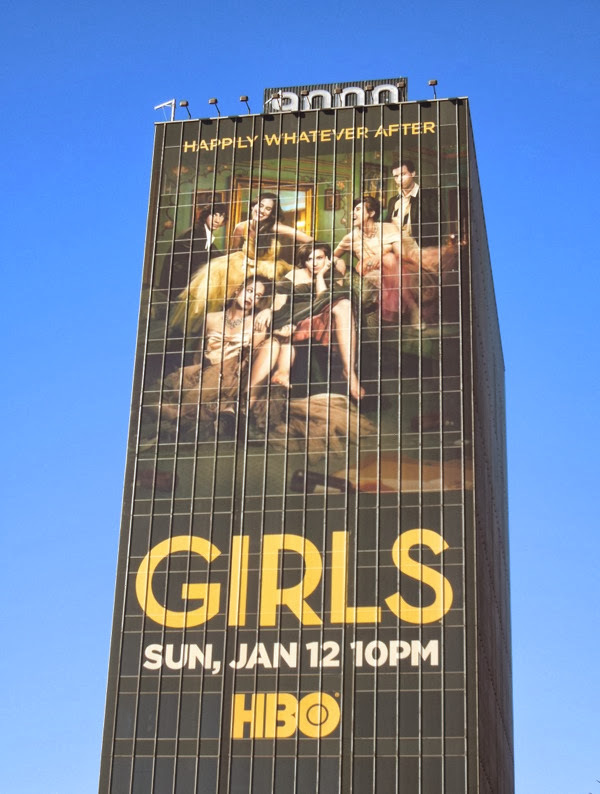 UPDATED: As Girls third season debut had the unenviable task of following the 71st annual Golden Globe Awards, it's no wonder that HBO supported the returning series with another giant-sized billboard. 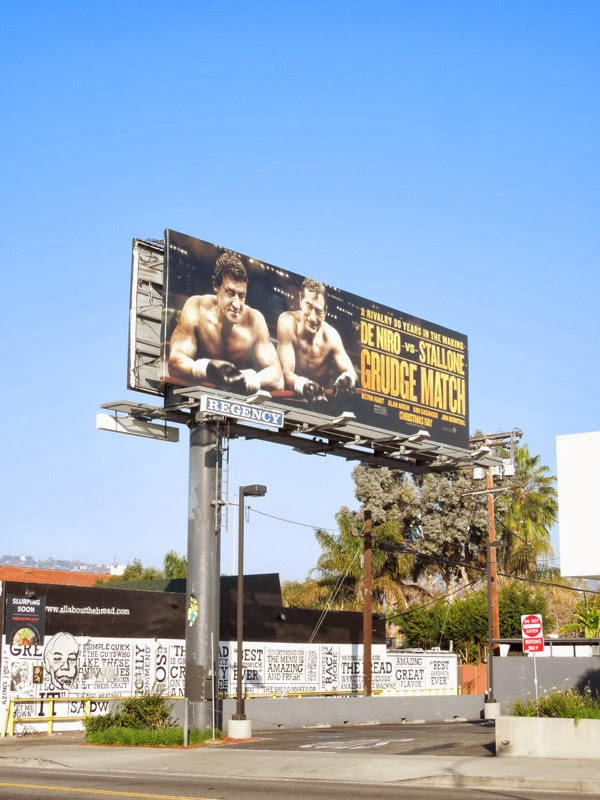 This spectacular billboard was snapped along L.A.'s busy Sunset Strip on January 13, 2014. 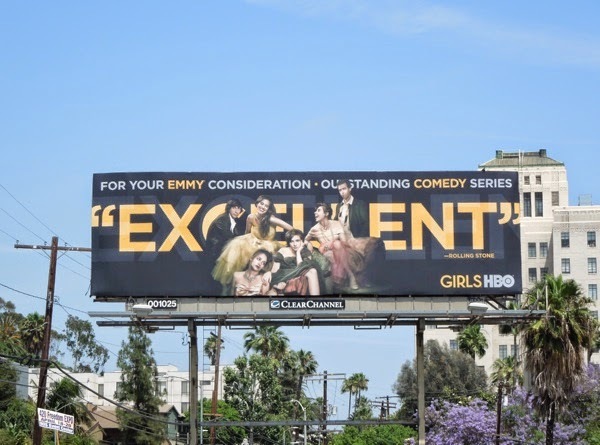 UPDATED: Here's also the Emmy Consideration billboard for Girls third season with the key art used with an 'Excellent' quote from Rolling Stone to help garner Emmy nominations. 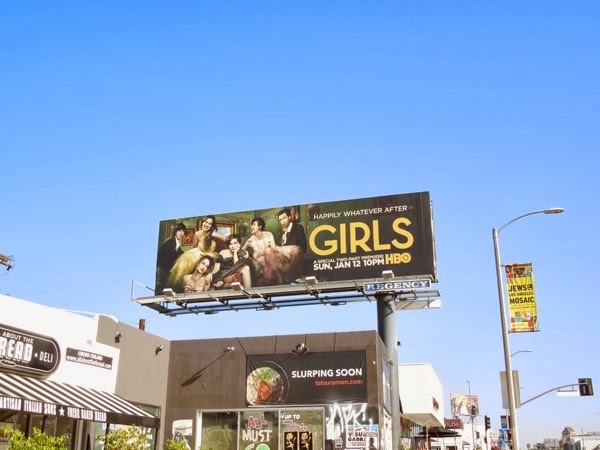 These billboards were spied along Highland Avenue on May 19 and along San Vicente Boulevard on May 25, 2014, and if you like these ads be sure to check out the rest of HBO's 2014 Emmy Consideration billboards from around the skies of L.A.
Are you over Christmas and the Holidays yet, and need something to cleanse your palate of all things festive? Well what about a spooky horror movie to see in the New Year and leave all those thoughts of good cheer and sugar plums behind you. 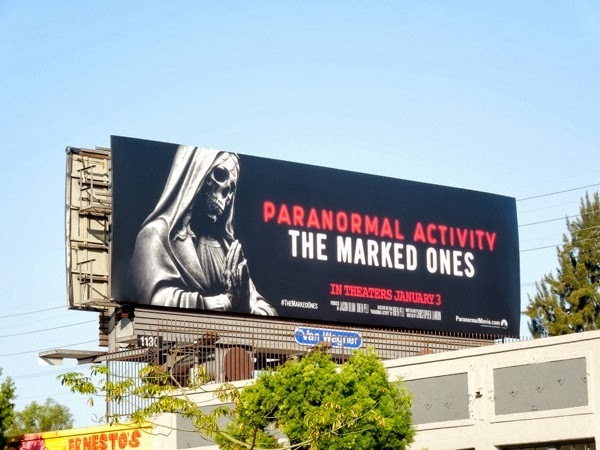 Paranormal Activity: The Marked Ones is the fifth film and first spin-off of the successful found-footage horror franchise. 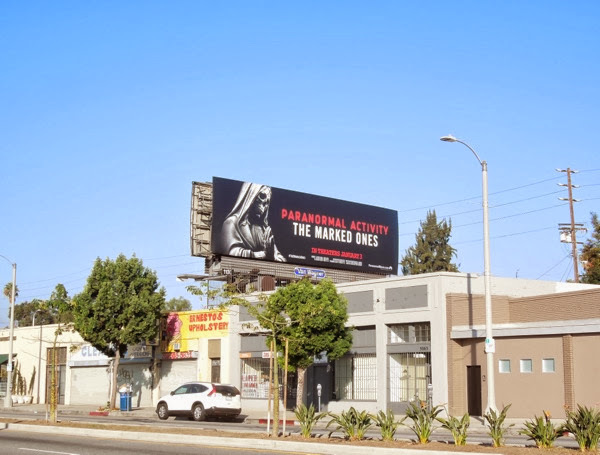 This latest installment takes place after the events of the fourth film but follows a Hispanic community in Oxnard, California, where a group of teenagers investigate a black magic cult and take on a demon who has 'marked' one of them. 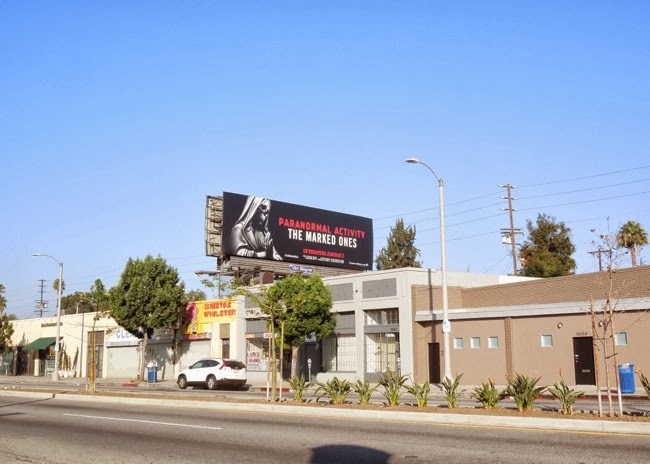 These deathly movie billboards were spied along Pico Boulevard on December 22 and along Melrose Avenue on December 24, 2013. 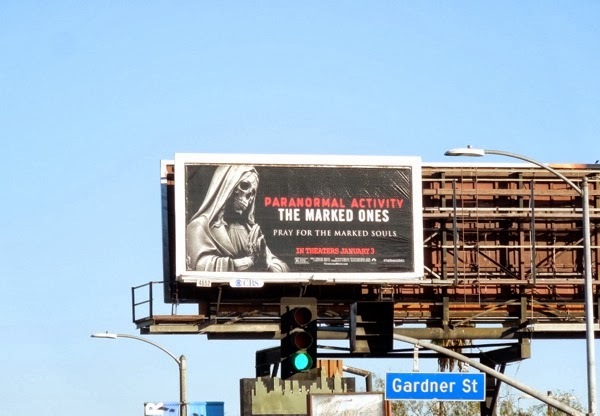 Are you ready for some scares in 2014? Are you ready for your New Year's Eve celebrations and have all the essential cocktail ingredients in your house to help you party in style? 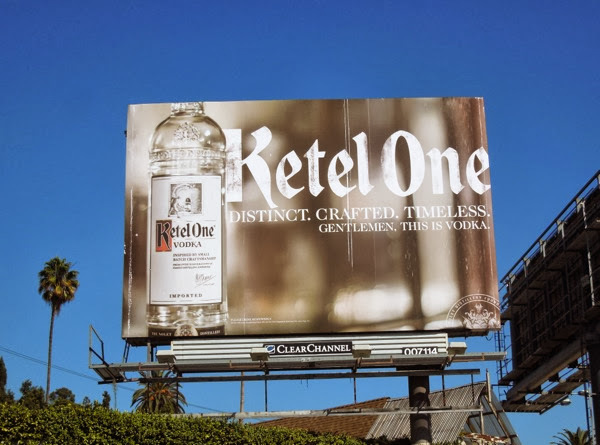 If you need some inspiration for what vodka to drink, Ketel One wants to reassure you of its quality credentials with its most recent ad campaign. 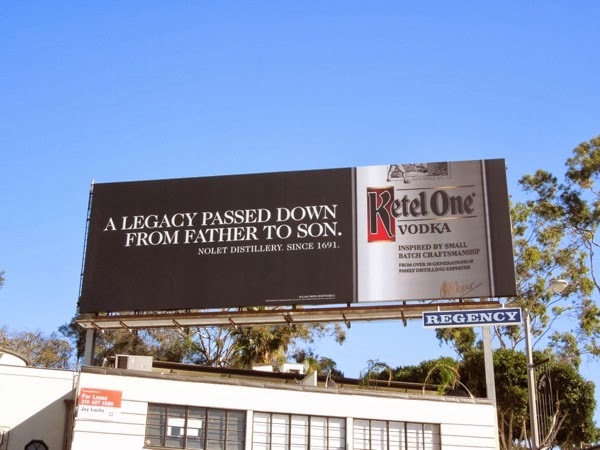 Gentlemen (and women), this is still vodka, but they want you to know how distinct, crafted and timeless their brand is, almost like a unique artisan vodka, rather than something you can buy by the bottle at your local store. 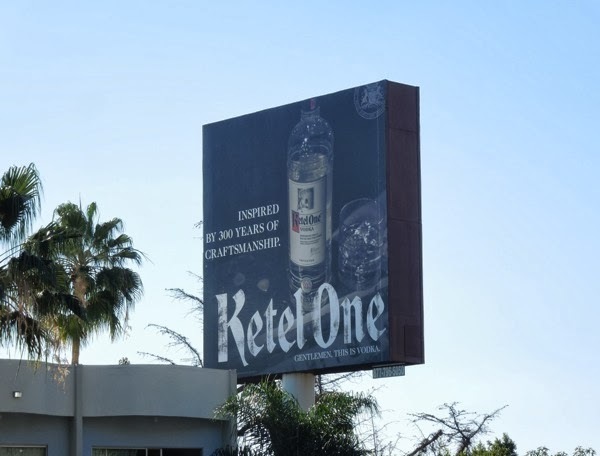 These Ketel One billboards were snapped along Sunset Boulevard eastbound on October 30 and westbound along the Sunset Strip on November 24, 2013. 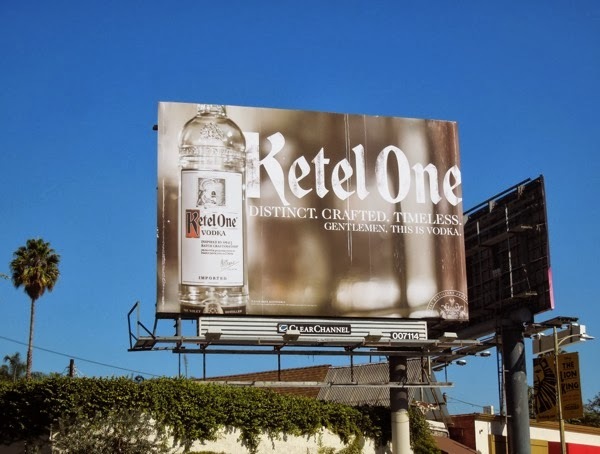 If you're a fan of the Dutch vodka brand, be sure to check out this previous Ketel One billboard campaign from 2011. 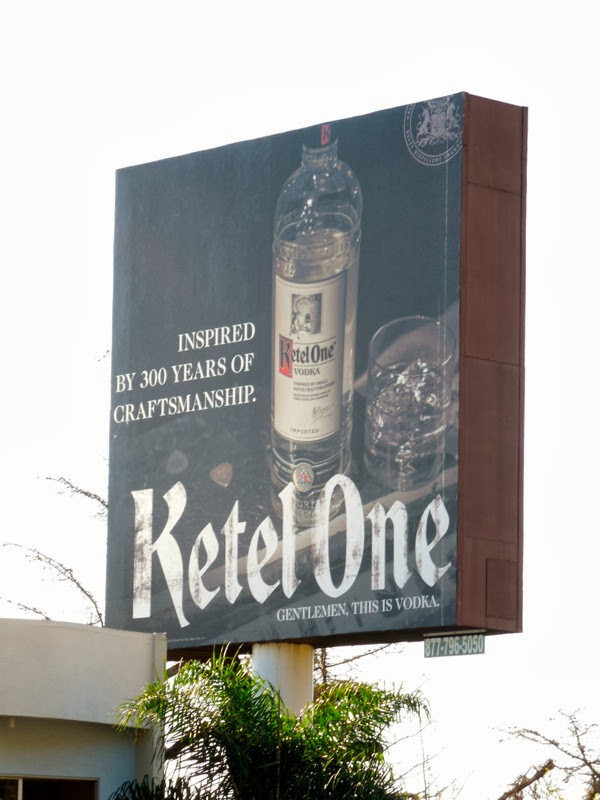 And if the clear spirit is your favourite tipple, take a look at how Ketel One's billboards compares to these other vodka brand ad campaigns. 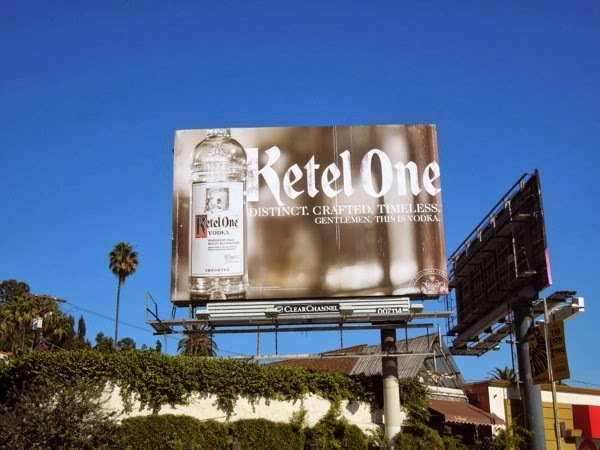 UPDATED: Ketel One continues to push its craftsmanship credentials in its latest billboard, which highlights 'a legacy passed down from father to son', and was snapped along Sunset Boulevard on March 8, 2014. 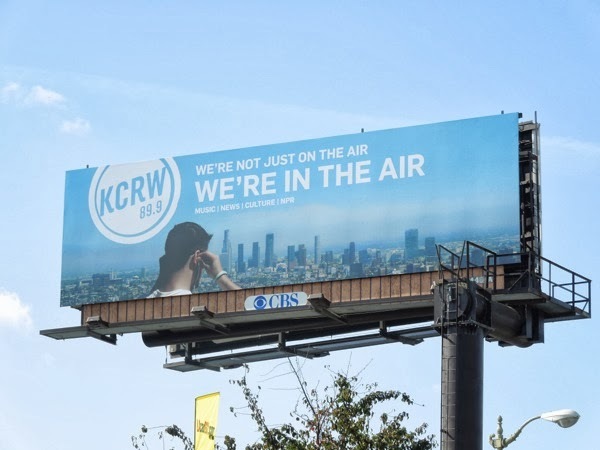 Maybe it's being based in L.A., but Daily Billboard really likes this ad creative for Southern California's KCRW public radio station with its view of Downtown Los Angeles. In health conscious Hollywoodland, having a runner putting in his headphones whilst overlooking the sprawling city captures the spirit of L.A. perfectly. 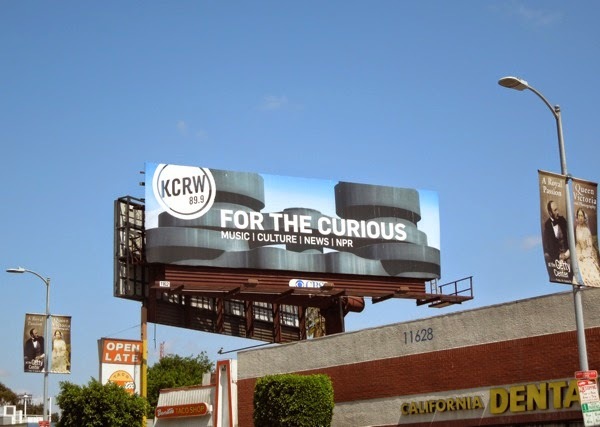 This evocative KCRW billboard was snapped along La Brea Avenue on November 12 and along Hollywood Boulevard on November 17, 2013. 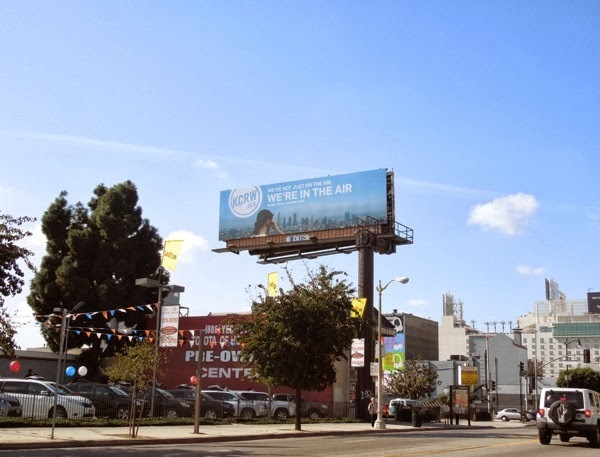 If you like this ad, be sure to also take a look at these different radio billboards for more examples of how other radio stations advertise. 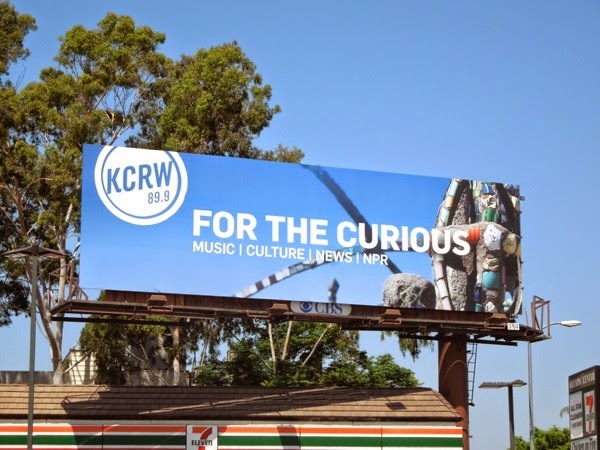 UPDATED: Following the Troika agency's refresh of KCRW's brand identity, here's a continuation of the new ad campaign for the radio station with this new billboard spied along Santa Monica Boulevard in West L.A. on May 22, 2014. 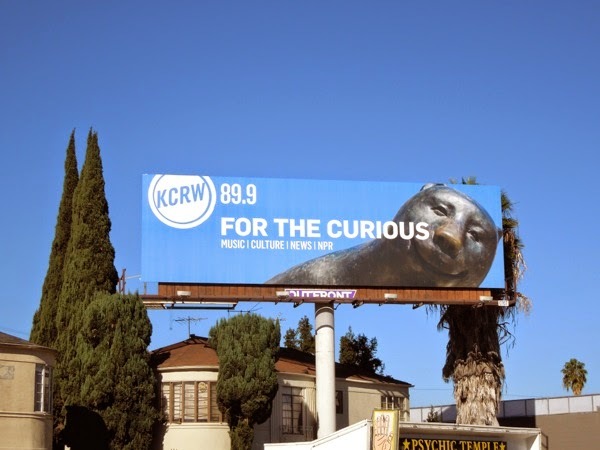 The 'For the curious' ad creative features the top of the Frank Gehry designed 'Binoculars Building' in Venice, which currently houses Google. 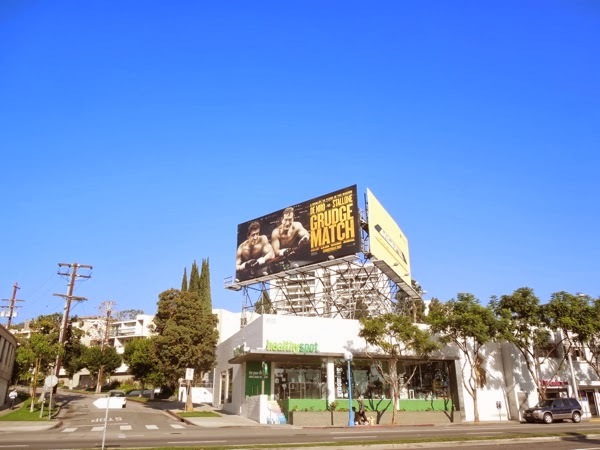 UPDATED: Here are two further executions in the 'For the curious' outdoor campaign, which feature titillating close-ups of L.A. landmarks of cultural or historical significance. First up is a closer look at 'Chicken Boy' statue aka 'The Statue of Liberty of Los Angeles' which used to stand atop the Chicken Boy Restaurant in Downtown L.A. until the early 80's until recently being rescued and restored by a local artist. 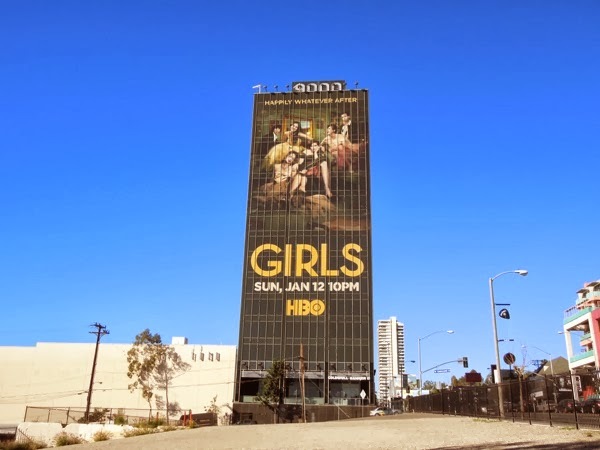 The next intriguing creative, also spied along La Cienega Boulevard on June 12, 2014, is of a section of the infamous 'Watts Towers' mosaic sculptural spires by Simon Rodia. 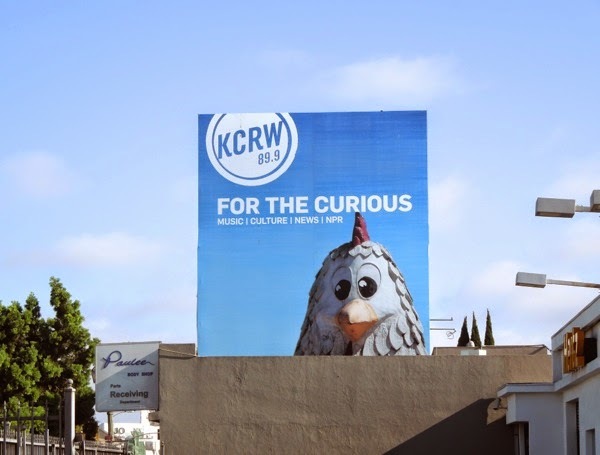 The ad campaign certainly lives up to the 'For the curious' slogan by teasing these images and appealing to the inquisitive natures of the radio stains listeners. 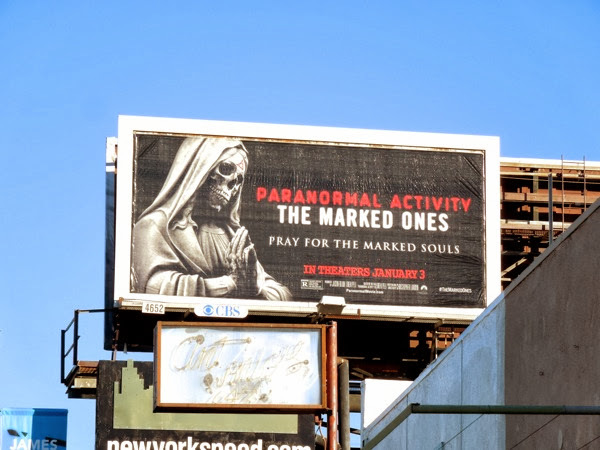 UPDATED: Here's another installment in this 'For the curious' outdoor campaign, this one featuring a closeup of West Hollywood's The Game bear sculpture. 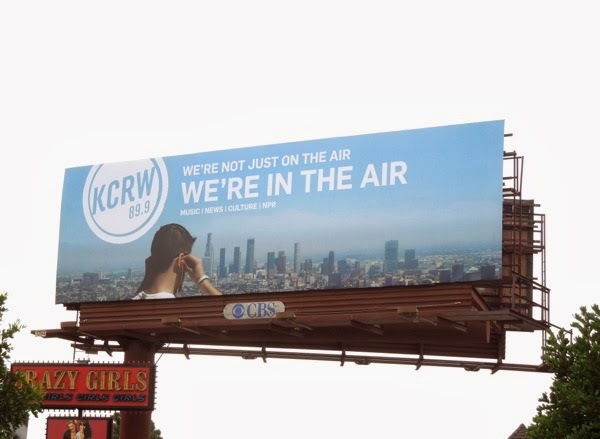 This playful KCRW radio station billboard was snapped along La Cienega Boulevard on November 26, 2014. 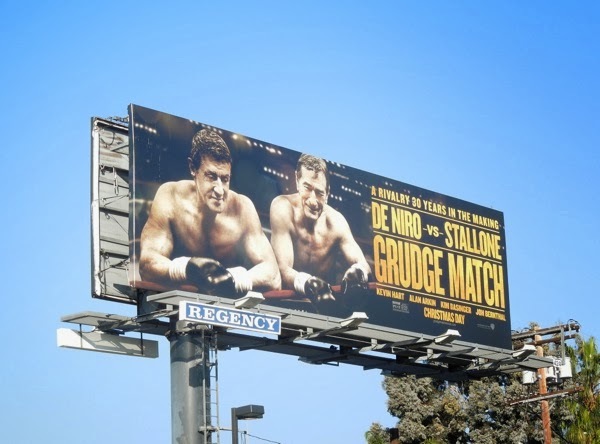 What do you get if the stars of Raging Bull and Rocky face off on the big screen? 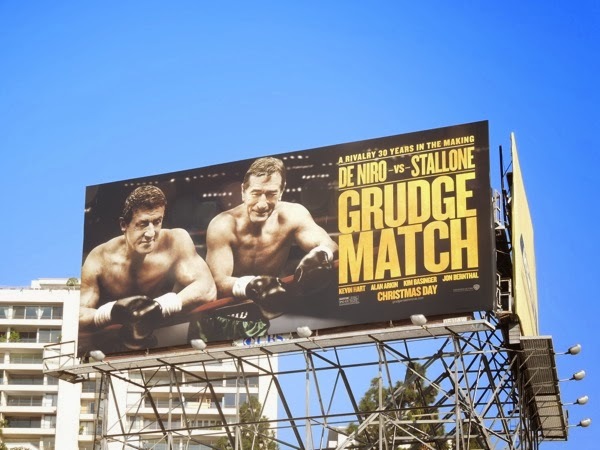 The perfect movie for Boxing Day, that's what (even though Britain's annual Christmas festivities actually have nothing to do with fighting). 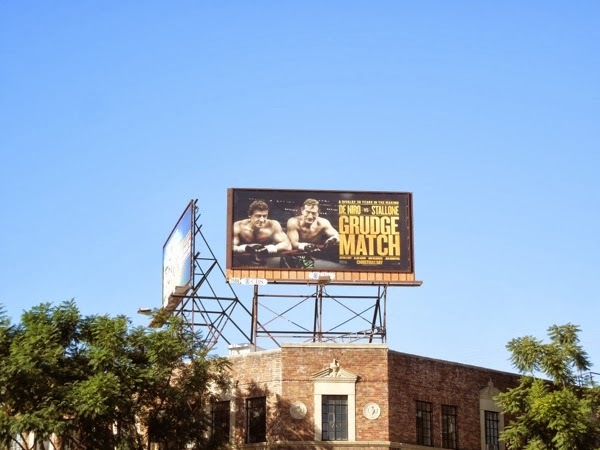 Grudge Match is a sports comedy starring Robert De Niro and Sylvester Stallone, both famous for their respective iconic boxing movies, as 'Billy "The Kid" McDonnen' and 'Henry "Razor" Sharp' who reignite their 30 year rivalry for one last fight. 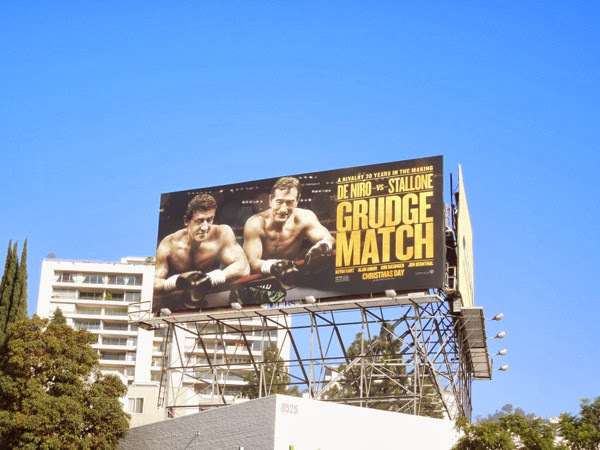 Can these box office legends take on the other movie contenders this Christmas and win, or will The Secret Life of Walter Mitty, Anchorman 2, The Wolf of Wall Street or 47 Ronin claim the coveted prize. 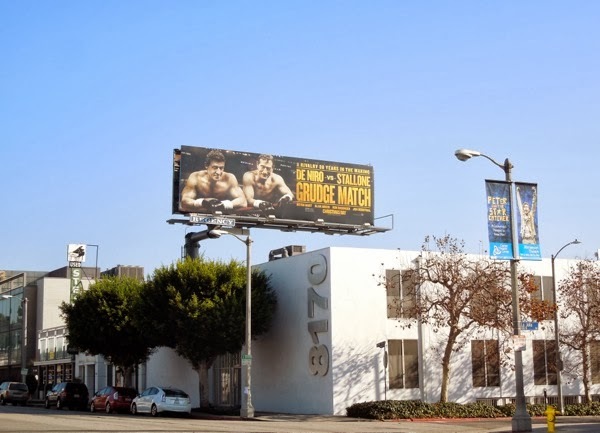 These Grudge Match billboards are everywhere around L.A. at the moment, in different shapes and sizes from Santa Monica Boulevard to Melrose Avenue, Highland Avenue to Beverly Boulevard and more. 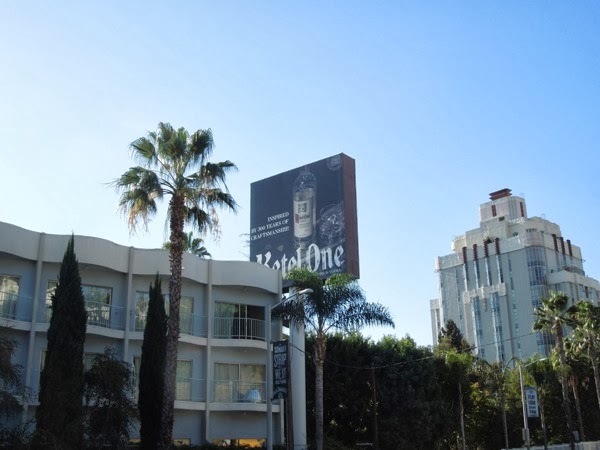 First appearing along Sunset Boulevard around November 15, this collection of ads were snapped from December 21 to December 23, 2013. 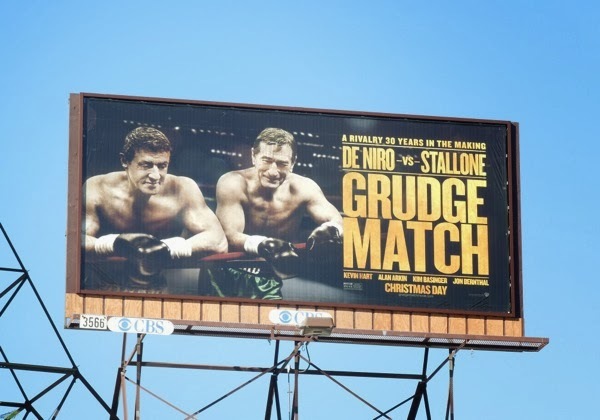 What do you think, will Grudge Match be a knock out this holiday season? Merry Christmas and Happy Holidays one and all! 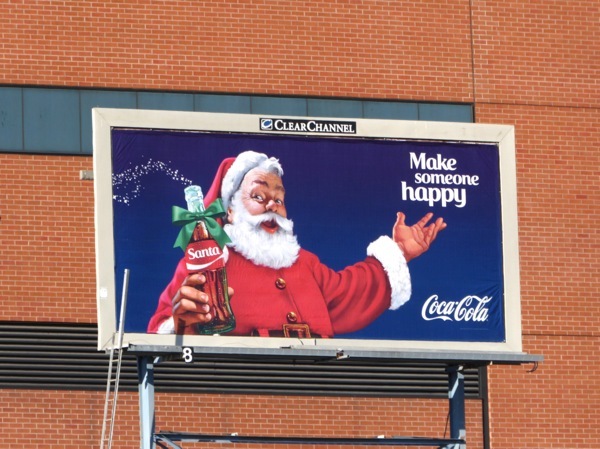 What would Christmas Day be without a jolly Coca-Cola Santa billboard. 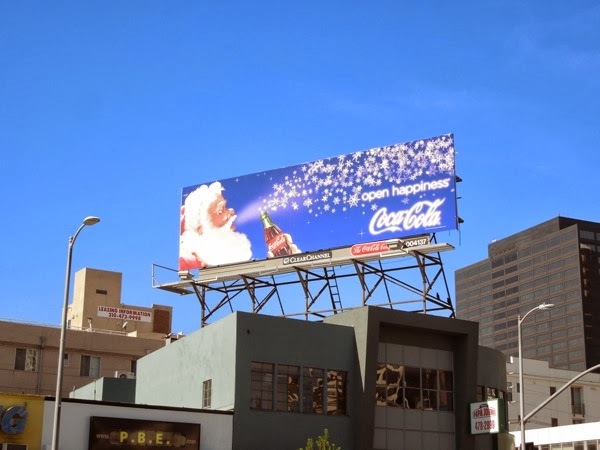 This year St. Nick is blowing off some frosty snowflakes from his ice-cold bottle of Coke, which makes for a nice festive visual. 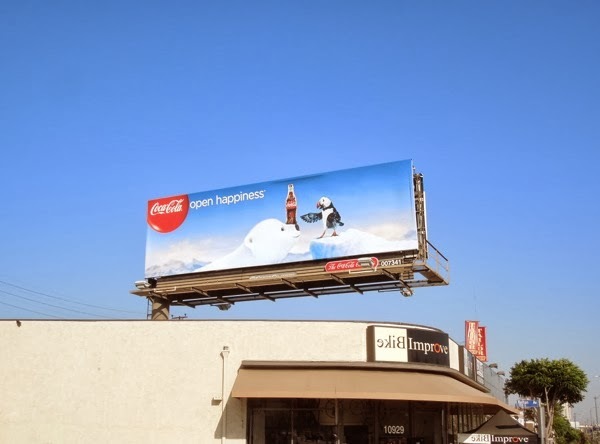 This year's festive Coca-Cola Open Happiness campaign also features cute cartoon-like polar bears and puffins sharing a drink together around the skies of L.A. 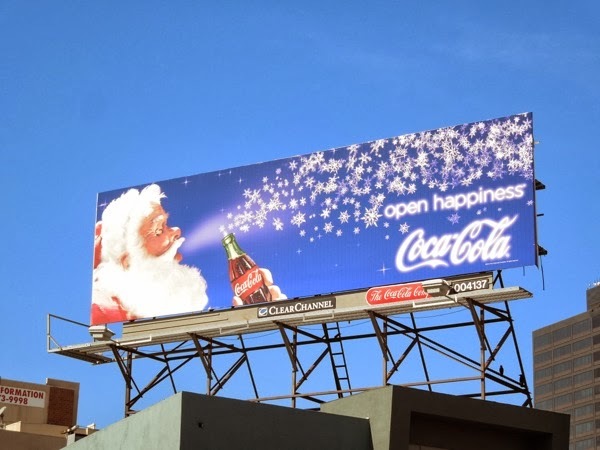 It really was a genius idea by Coke in 1931 to use Father Christmas to help sell more of the cola brand outside of the hot weather season, and the iconic 'Coke Santa' really has become an integral part of pop culture. 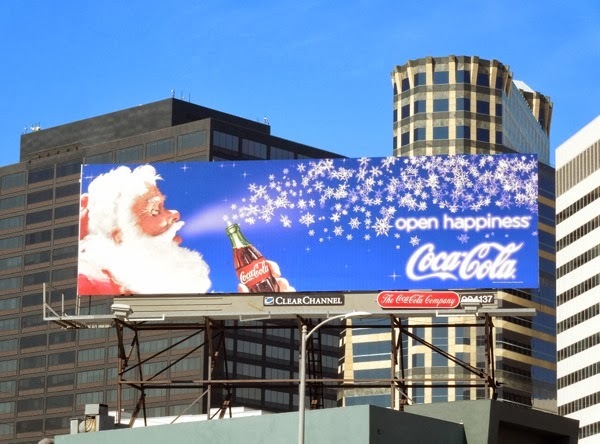 If you're a fan of Coke's Kris Kringle, be sure to check out these Coca-Cola Santa billboards from 2008 and 2009, plus the Coke Santa billboard ad from 2010 and the festive Coca-Cola Santa from 2012. 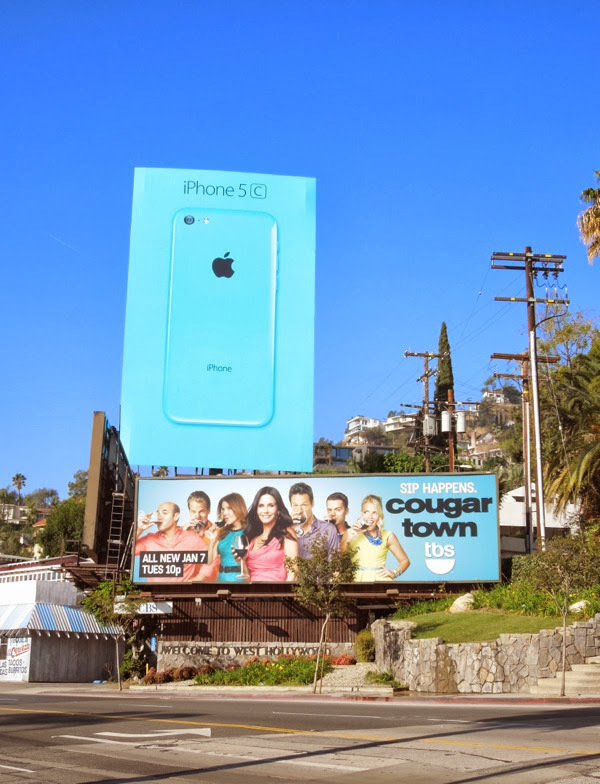 Which ad design is your favourite? 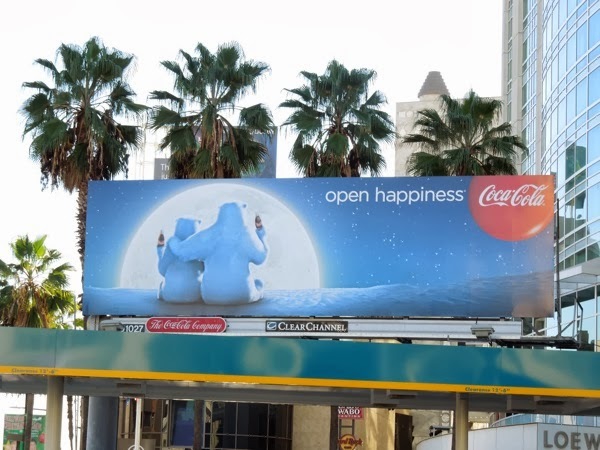 Daily Billboard's only criticism of this year's Santa ad is that both the 'open happiness' tagline and Coca-Cola logo may look festive, but from a distance become very blurry and hard to read in that glowing font. 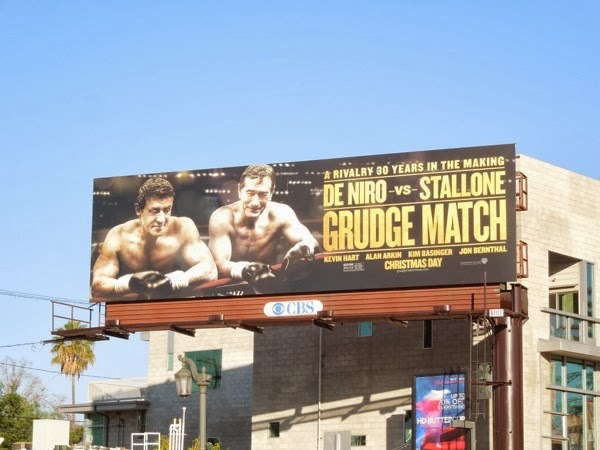 If you're wondering where the 2011 version is, Daily Billboard couldn't find one at the time and thinks it may have been replaced by Coke's Arctic Home Polar Bear ad campaign instead, which had a charity and environmentally-friendly theme to help the wild animals in their natural habitat. 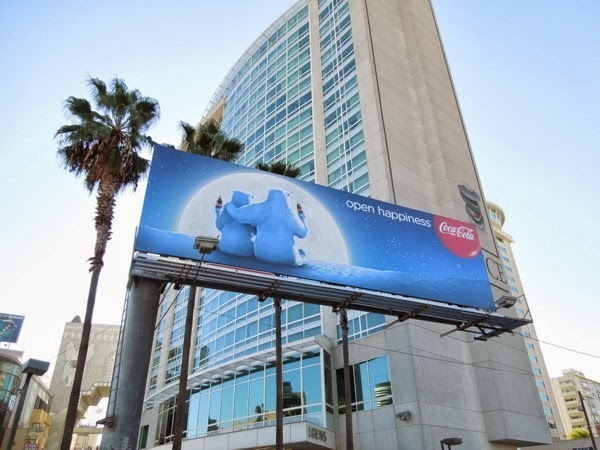 This year's snowflake blowing Santa billboard was snapped on November 11 along Westwood Boulevard, whilst the puffin and baby polar bear creative was spotted along Santa Monica Boulevard a day earlier on November 10, plus the polar bears sitting in the moonlight was spied on November 14, 2013 at near Hollywood & Highland. 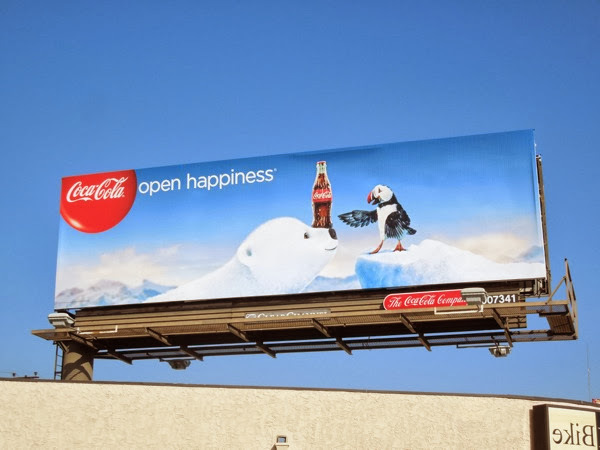 Hopefully these billboard ads have helped fill you with some festive cheer, so have a wonderful day and remember to crack open a Coke if you need to quench your thirst, or help wash down your Christmas lunch. 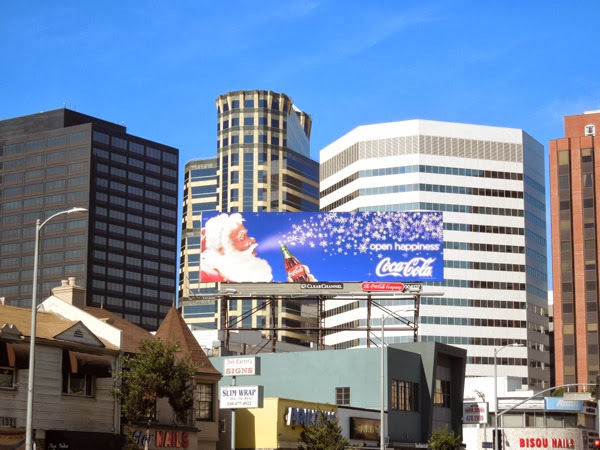 UPDATED: To add to the collection, here's also the jolly 2015 Coke Santa snapped above San Vicente Boulevard on December 16, 2015.